Note: This ebook was provided by Harmony Ink Press in exchange for an honest review. We're so close now; I feel such an incredible tender rush of desire to stop his tears with my lips, to feel the salty skin of his cheek beneath my tongue. I've come to realize it's possible to take away pain with such action, to show you love someone without saying a word. Do not judge a book by its title! 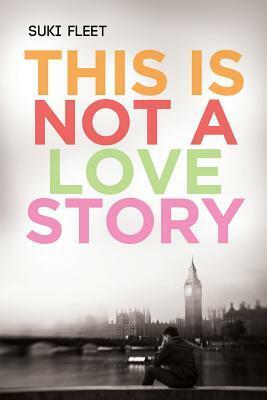 This Is Not a Love Story is really and truly a love story but it's also so much more than that. This is my third Suki Fleet read and while I was feeling iffy over my first read, both the second and now this third have me thoroughly impressed and craving for even more from the Love Story universe Fleet has created. We're introduced to fifteen-year-old Romeo Danilov, who found himself homeless after his mother failed to return to the home they were staying at. Left to fend for himself, he finds a small set of allies--people that he can turn to in the most desperate of circumstances. But it's Julian Lavelle, who is only a couple of years older, who is his constant, his closest friend who has gone above and beyond in order to not befall the fate of other runaways and homeless teens. As Julian takes care of the boy he's nicknamed Remee, he's found a greater purpose. However, the harsh realities of life on the streets of London can never be truly ignored, and when outside forces and returning vices takes Julian away from him, Remee will have take a stand, make hard choices, and fight for his life...and love. I'm not too proud to admit that Remee's story made me cry. At fifteen, I was entering my senior year of high school and the most difficult thing in my life then was going on a carb-free diet recommended by our family doctor and then training to keep my grades up in order to graduate and get my diploma at sixteen. I can only imagine what Remee, Julian, Pasha, and the rest of the boys--and that's what they were at the end of the day--had to suffer through simply to make it through twenty-four hours and see the next twenty-four. Teens like them are, sad to say, far more commonplace than you could imagine. Remee, who is mute but is able to communicate via sign language, reading lips, and jotting notes, is a gifted young artist, and I love how he encapsulates the people and places that touch him in one way or another with pen and paper. He's not like other kids his age who snap photos of their friends and take selfies galore, but he makes do and rarely bemoans his circumstances, simply grateful that Julian is with him and that they make it through to the next day. This fictional boy...I swear, he's unlike any other I've met. Purchase This Is Not a Love Story on Harmony Ink Press | Amazon | B&N | iBooks | Kobo.